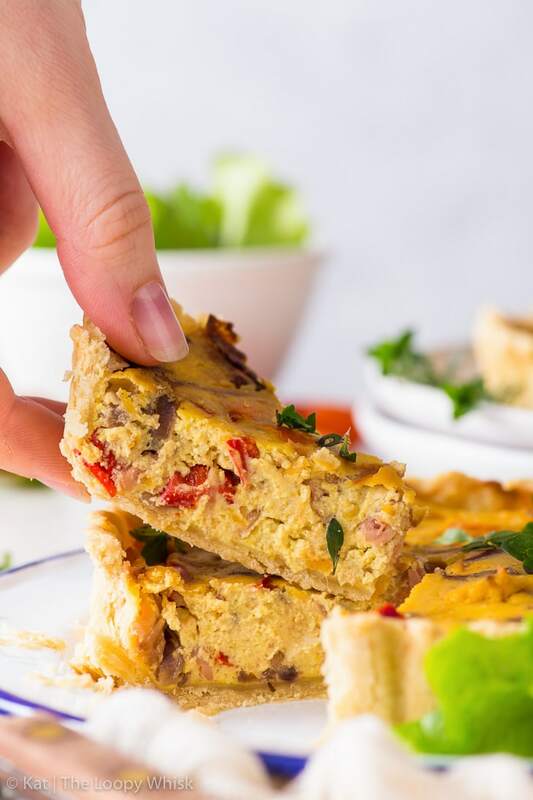 This vegan quiche is comfort food at its best. 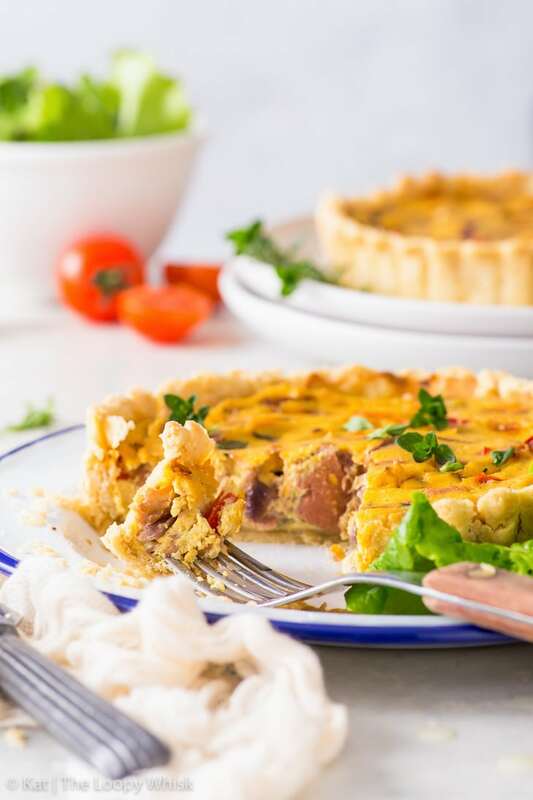 With a flaky, almost buttery olive oil pie crust and a delicious filling with caramelised onions, peppers and jackfruit – it will be the highlight of any lunch or dinner. Today’s offering is comfort food at its best. 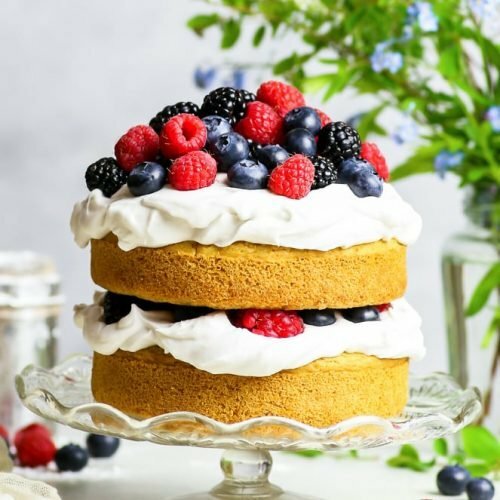 Easy to prepare, heart-warming and terribly delicious. Full of caramelised onions, the vibrancy of orange and red peppers, and the strange but wonderful magic that is jackfruit confit. 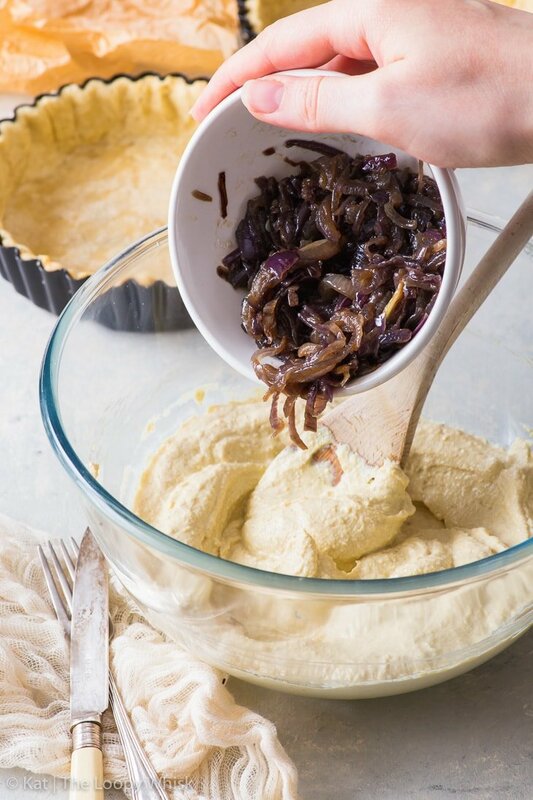 And if there are caramelised onions involved… you know it’s going to be good. 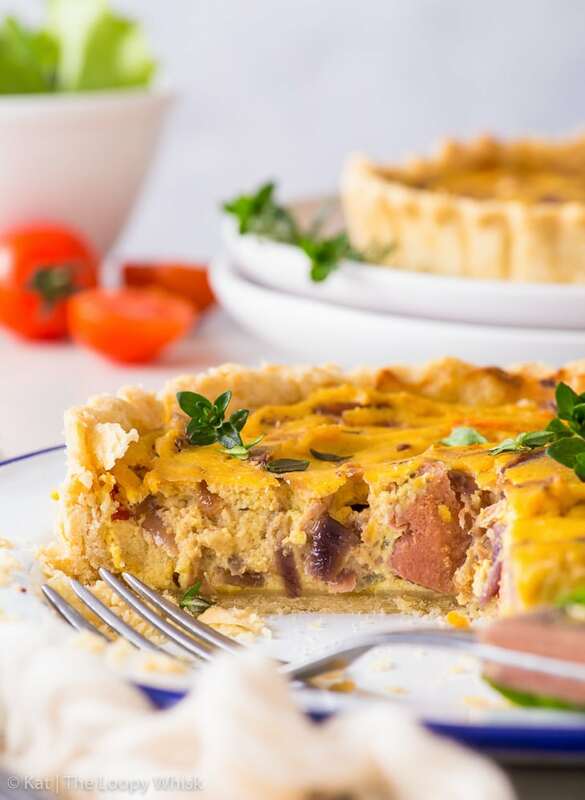 Yes, we’re talking vegan quiche today. 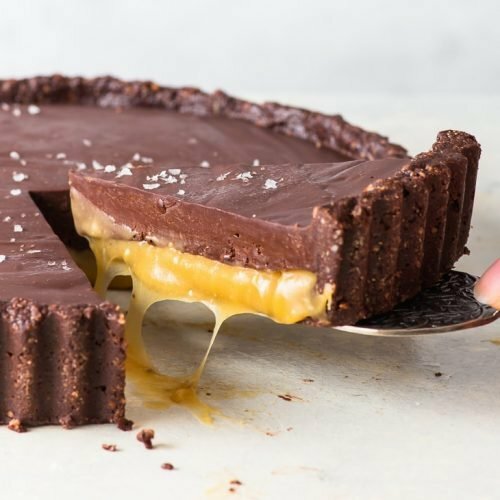 I know, it may seem virtually impossible (or, at least improbable) to take a dish that is renowned for its buttery crust and egg-rich filling and turn it vegan… but trust me, it can be done. And the results are simply out of this world. 1. The textures are amazing. 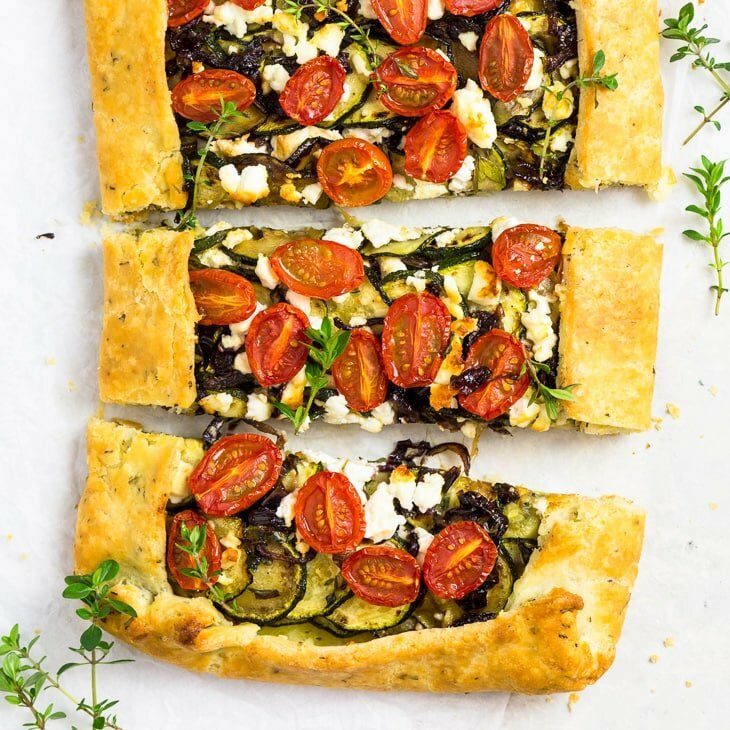 The crisp flakiness of the olive oil pie crust with the creaminess of the filling is a simply divine combination. 2. The flavours are all about comfort. 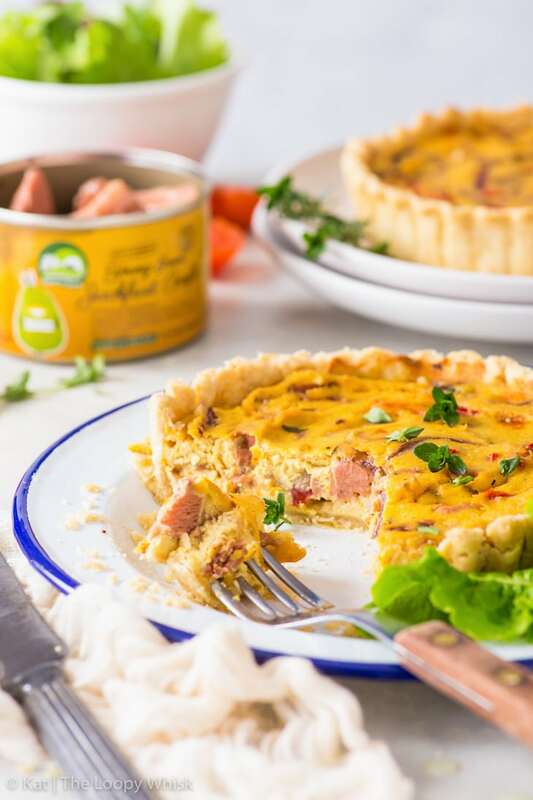 From the caramelised onions to the jackfruit confit, everything about this quiche is hearty and simply delicious. 3. It’s easy to make! 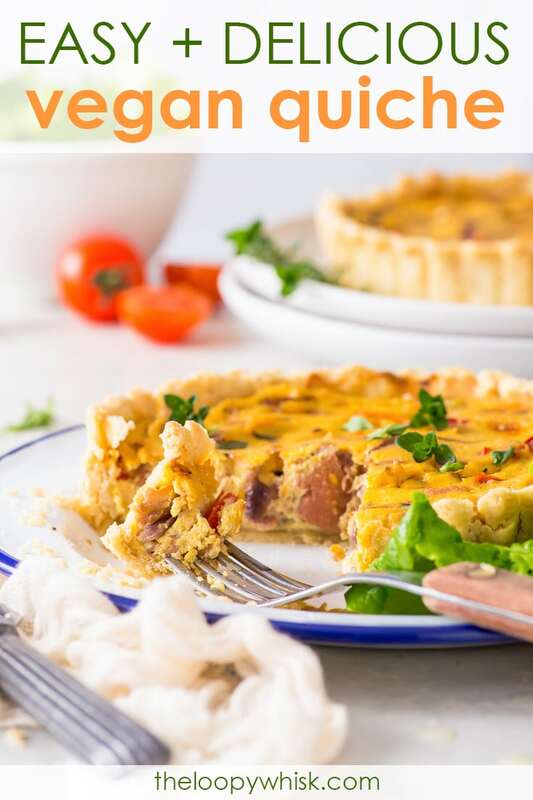 Seriously – if you know how to stir a few things together, can use a food processor or blender, and know how to caramelise onions… then you can totally make this quiche. It’s. So. Simple. 4. It’s vegan and not at all obvious about it. 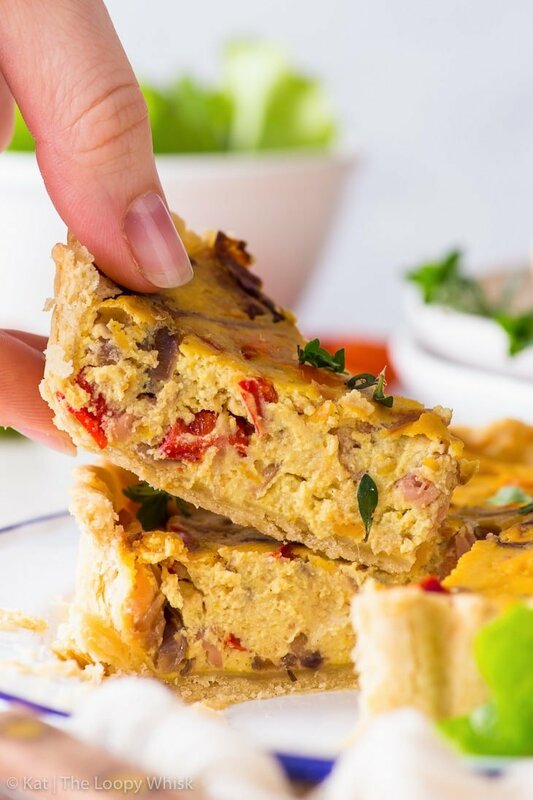 Regardless of whether you’re actually vegan or not, I promise you’ll LOVE this vegan quiche. 5. And it’s super versatile. While I suggest the fillings that I love (and I’m sure you’ll love too), you could easily swap the peppers for broccoli, caramelised onions for lightly fried garlic… the possibilities are endless! 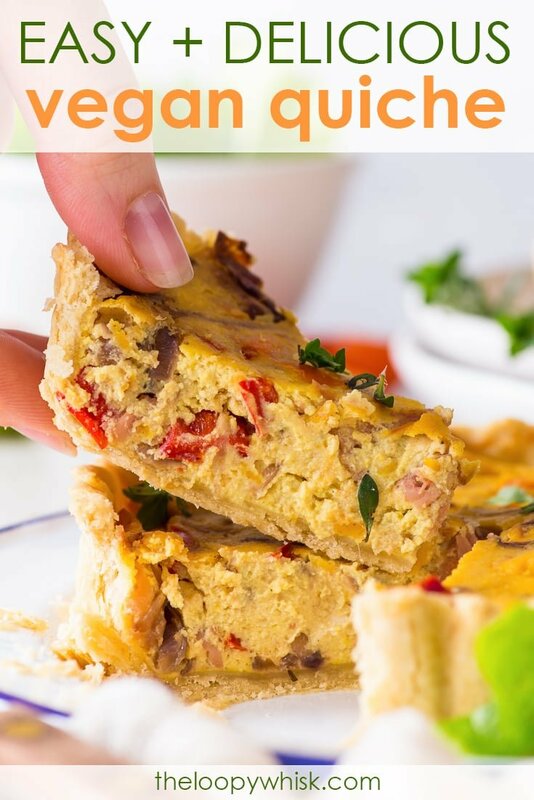 How do you make vegan quiche? First, we have the olive oil pie crust, which is perfectly flaky, just crumbly enough and almost buttery in its deliciousness. In fact, it’s a close contender for my all-time favourite pie crust. Yes, it’s that good. That’s it! 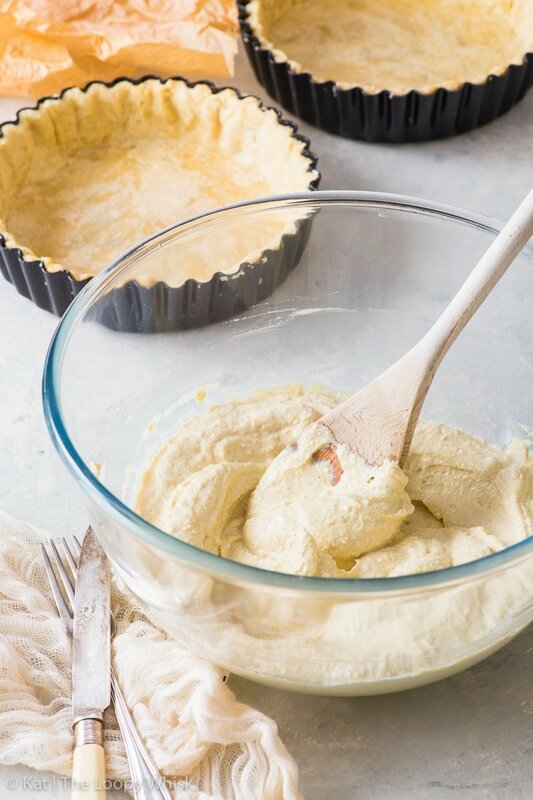 And making the pie crust is as easy as mixing all the ingredients together with a fork until the dough comes together, chilling it in the fridge for about 15 minutes, rolling it out to about 2 mm thin and placing it snugly into the tart tins. For a perfectly crisp pie crust, it’s best to blind bake it at 390 ºF (200 ºC) for 10 minutes. 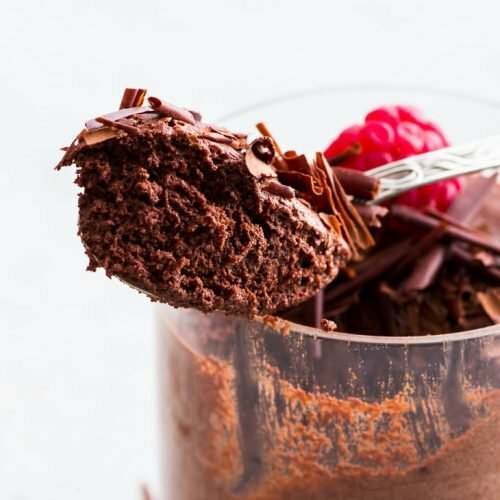 All these ingredients are blitzed together in a high-speed blender or food processor until smooth and creamy. 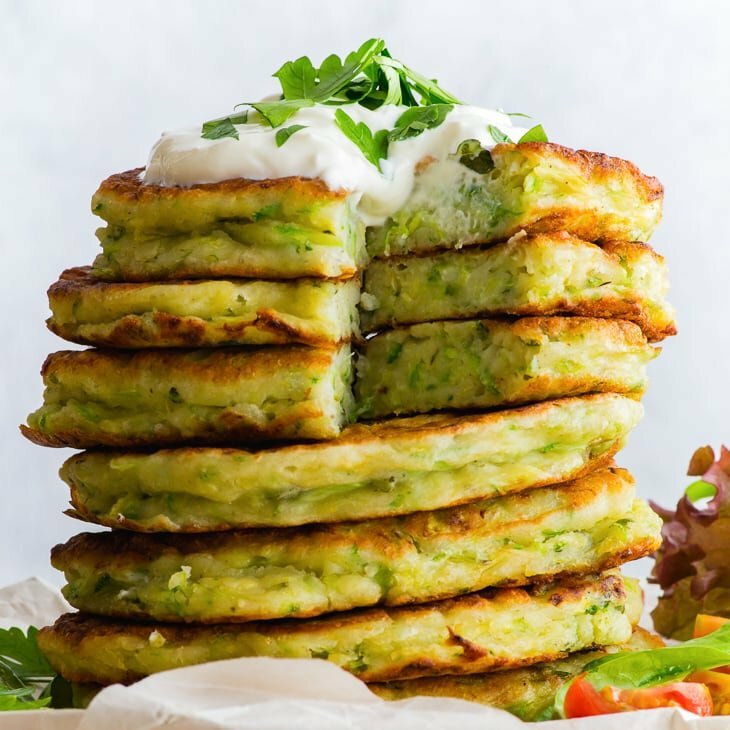 You’ll probably think the filling is too thick to work (it will resemble hummus in consistency) but don’t worry – that’s how it’s supposed to look! 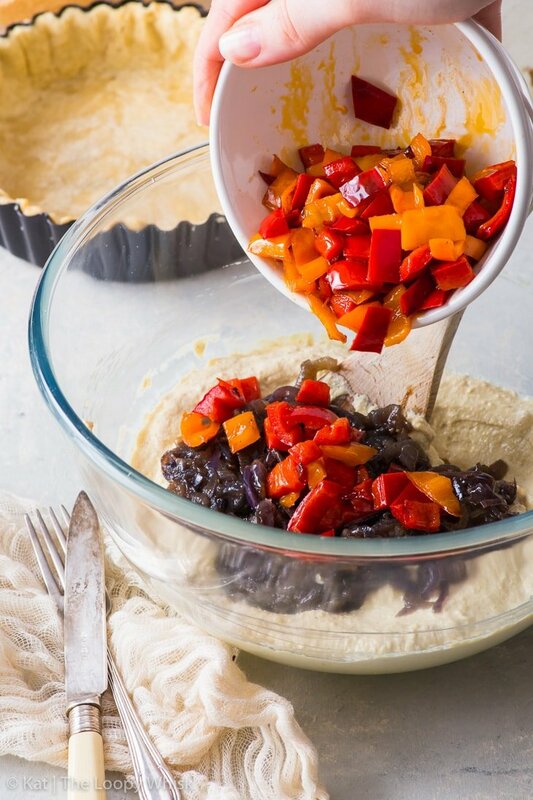 And then… transfer the filling into the blind baked pastry shells, and bake. Until puffed up and light golden brown on top and smelling absolutely divine. I’ve tried jackfruit confit for the very first time a few weeks ago, and I’ve been a fan ever since. More factually, we’re talking about the fruit of the jackfruit tree – when packaged with herbs and spices in olive oil, it becomes a great vegan meat substitute with a hearty flavour. 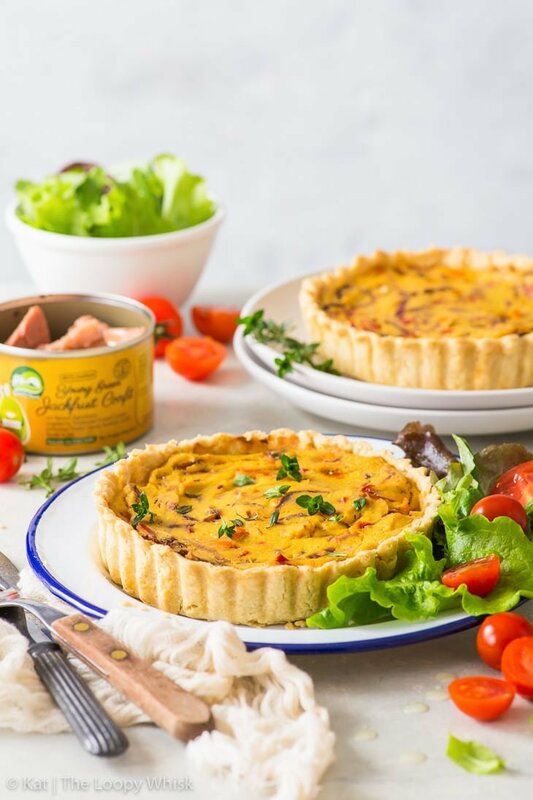 Personally, I find that Nature’s Charm Jackfruit Confit tastes like a cross between artichokes and mushrooms with a meaty texture, which works wonderfully for savoury dishes such as this vegan quiche. 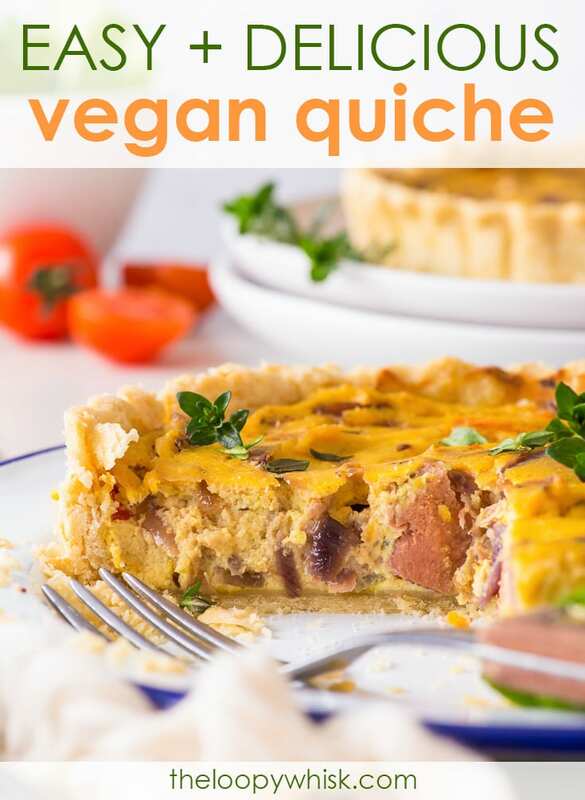 I could honestly have this vegan quiche for lunch every day, and never get tired of it. 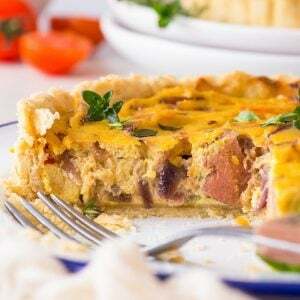 It mimics your usual quiche wonderfully – from the flaky pie crust to the gently salty, aromatic filling that tastes almost cheesy. But it’s not just a mimic. It’s more than just a dish that strives to be as good as it’s non-vegan original version. No, my aim is always to make it as delicious as it can be, to take it to the very heights in terms of taste, texture and appearance. 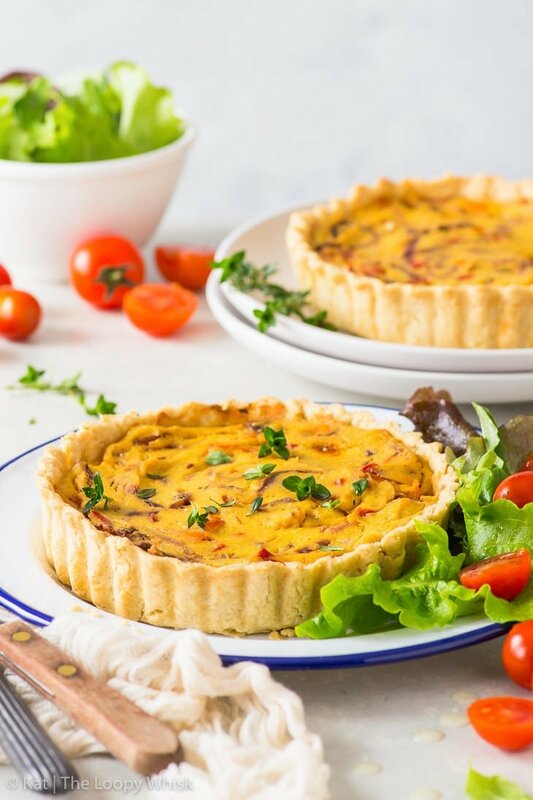 And this vegan quiche – well, it’s mouth-watering, pretty and just plain wonderful. You don’t need to compare it to anything to be able to see and taste that. So give it a try. Enjoy. And thank me later. 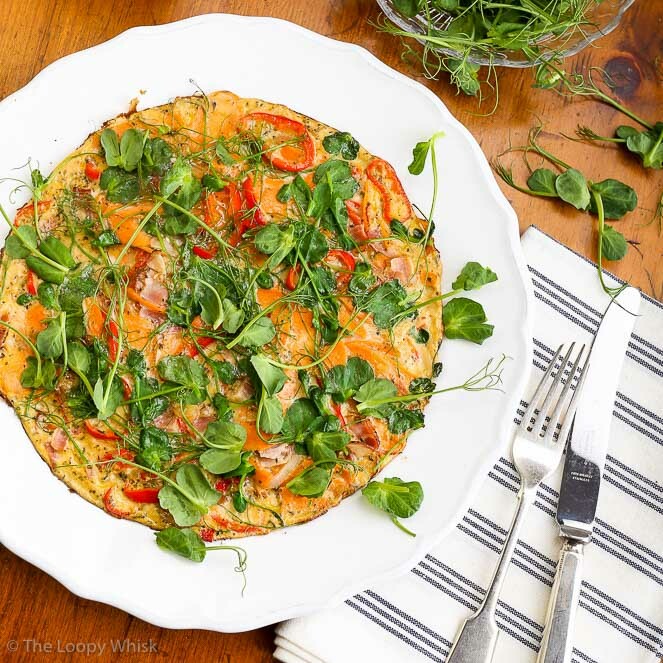 NOTE: This recipe makes two 6 inch (15 cm) or one 9 inch (23 cm) vegan quiche. In a bowl, mix together the flour and salt. Add the olive oil, and mix well with a fork until all the flour is coated in the oil. Some of the flour will start clumping together, that's alright. Mix together the cold water and apple cider vinegar. Add this mixture, a tablespoon at a time, to the flour+oil mixture, mixing well after each addition, until the pie dough comes together in a ball. You will need 3 - 4 tbsp of the water-vinegar mixture in total. 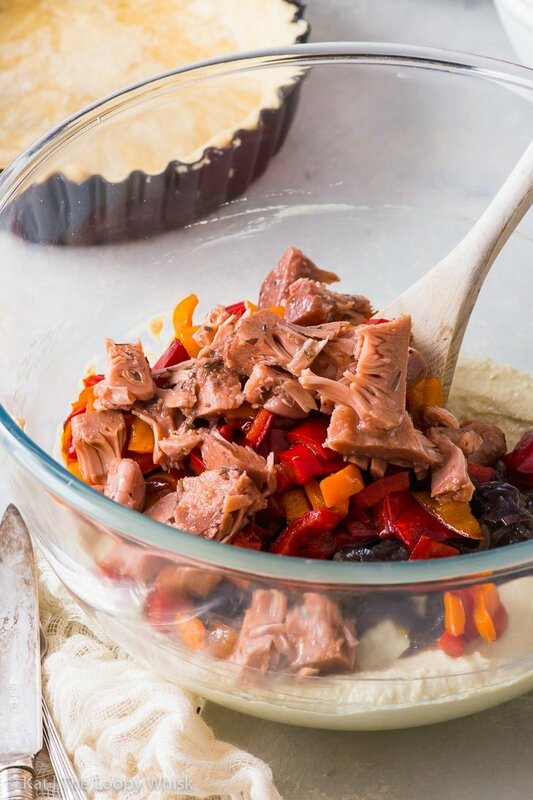 Wrap the pie dough in cling firm and refrigerate for 15 minutes. Pre-heat the oven to 390 ºF (200 ºC) and get two 6 inch (15 cm) or one 9 inch (23 cm) loose base tart tin(s) ready. Roll out the chilled pie dough until it's 2 mm thin (I find this is easiest to do if you place the pie dough between two pieces of cling film or baking/greaseproof paper). Transfer the rolled out pie dough into the tart tin(s) and make sure it's snug against the sides. Cut off any excess dough. Line the pie dough/pastry shell with baking/greaseproof paper and fill with baking beans or rice. Blind bake at 390 ºF (200 ºC) for 10 minutes, then remove from the oven. 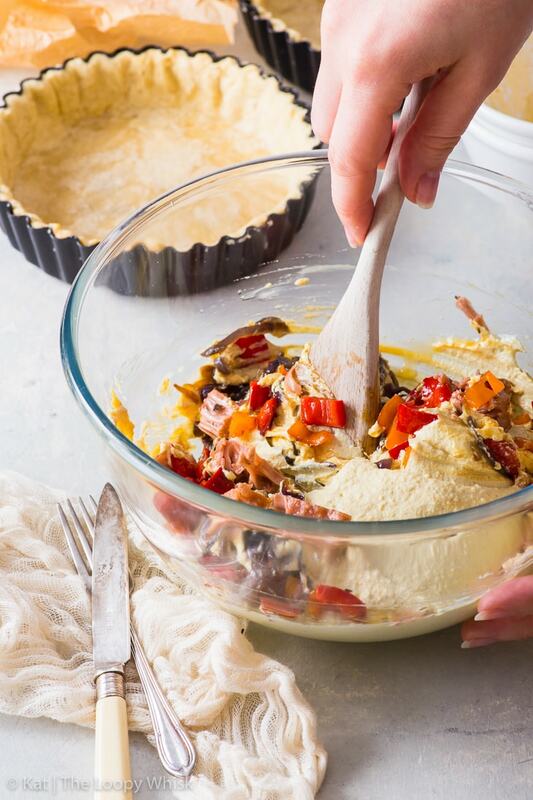 Remove baking beans/rice and baking/greaseproof paper, and set the blind bakes pastry shells aside until needed. 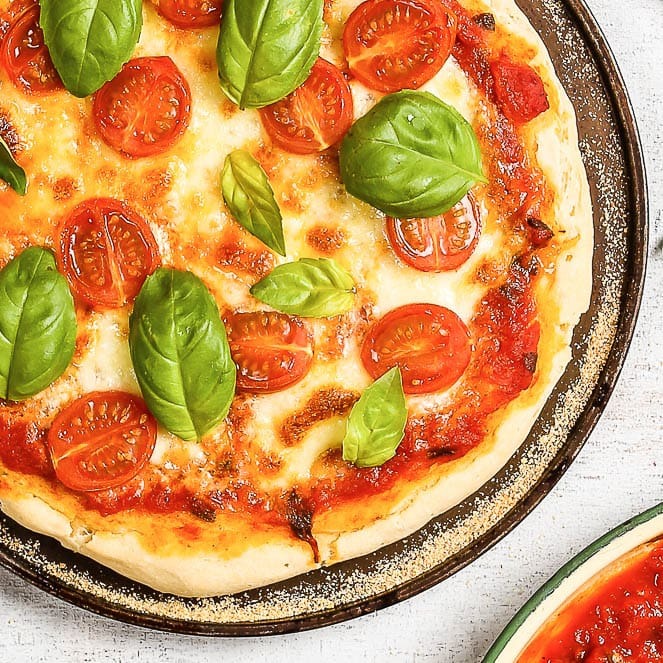 Reduce the oven temperature to 355 ºF (180 ºC). In a high-speed blender or food processor, blend the tofu, hummus, chickpea flour, baking powder, water, salt, pepper and turmeric until smooth. Transfer to a bowl and stir in the caramelised onions, lightly fried peppers and jackfruit confit. Spoon the filling into the blind baked pastry shells, smooth out the top, and bake at 355 ºF (180 ºC) for about 30 minutes, or until the filling has puffed up slightly, feels firm (and not sticky) to the touch and is light golden brown on top. 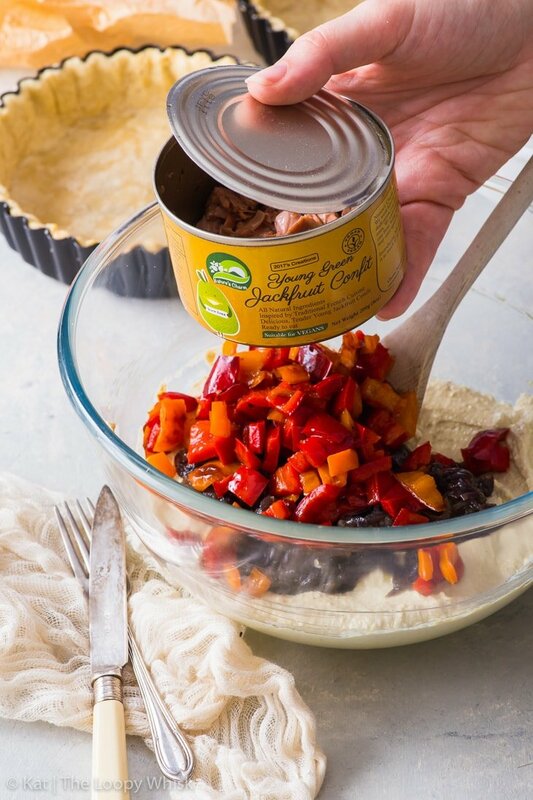 Allow to cool slightly, remove from the loose base tart tin(s) and serve. 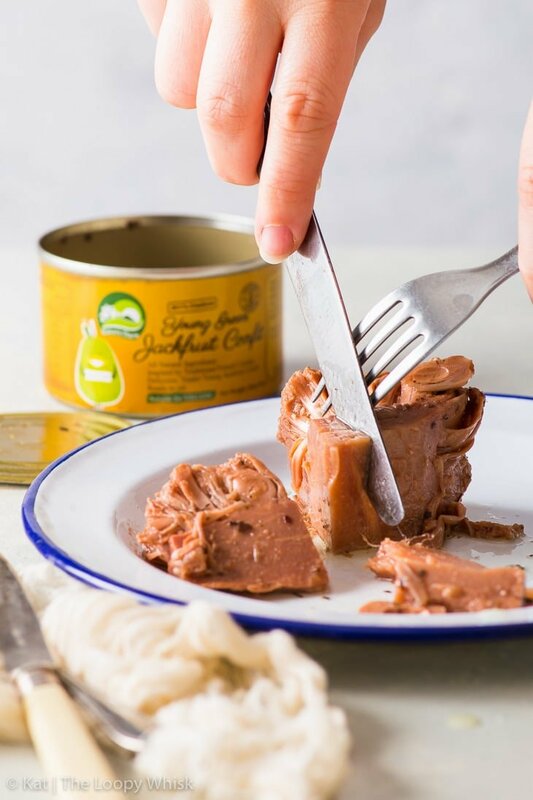 Note 1: I'm a huge fan of the Nature Charm Jackfruit Confit – it has a wonderful flavour and texture! 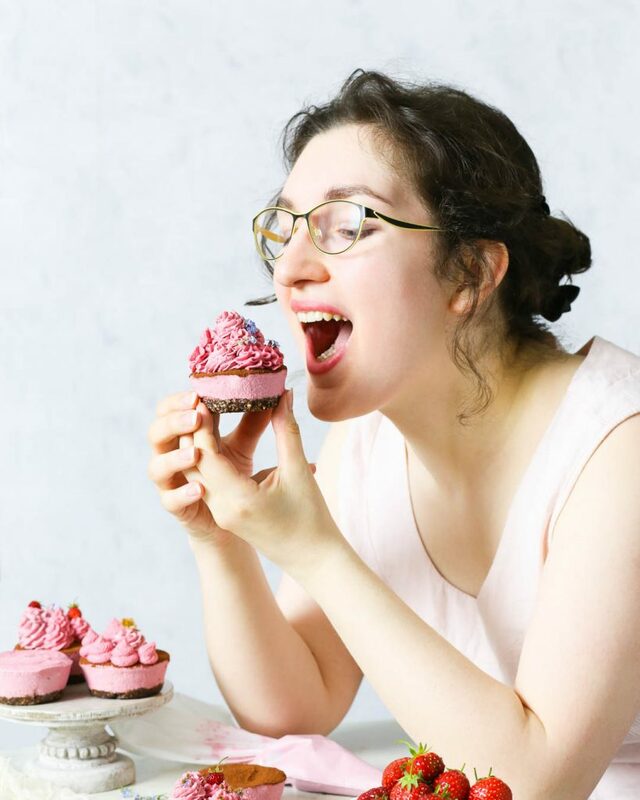 Looking for the perfect vegan dessert to go with the quiche? 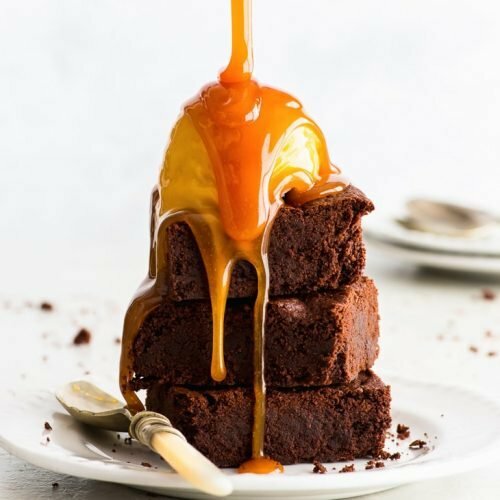 Is it possible to make this gluten free as well?